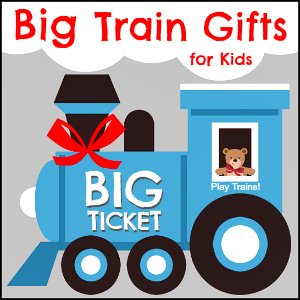 When I wrote Train Gifts for Toddlers as part of the 50+ Gift Guides for Kids series last year, it was the first post in a series of train gift guides for children organized by age. 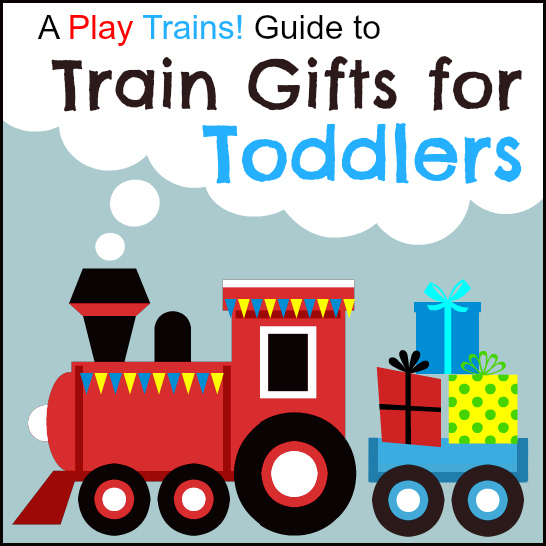 Now fully updated, it contains even more amazing toy trains, train books, and other train gifts for toddlers! This post was originally published on November 14th, 2013. It contains links to Amazon.com. If you click on one, we will receive a small commission — at no additional cost to you — on anything you buy at Amazon for a certain length of time afterwards. Read our disclosure policy for more details. My son, the Little Engineer, began his love affair with trains as a one year old. One of the challenges was figuring out what train toys were appropriate for him at that age. Of course, that’s still a challenge three years later as I wonder if he’s ready for his first model train, but there are more safety concerns with toddlers than with (almost) four year olds. Wooden train sets, for example, often have parts that can be choking hazards, and then there are the magnets to worry about. 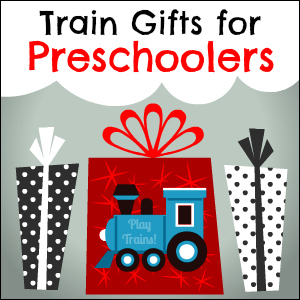 If your child is on the upper end of toddlerhood, you might want to also have a look at our list of Train Gifts for Preschoolers. On the other hand, there are plenty of fun and safe toys even if your child is still in the putting-everything-in-the-mouth stage. And I’ve noticed that Thomas Wooden Railway’s age recommendation has come down from being generally three years old and up to often being two years old and up. Whichever stage your child is at, I think you’ll find some great gift ideas on this list! 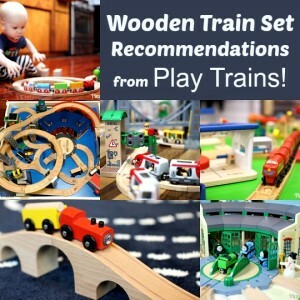 If you think your child is ready for wooden trains, I wrote up my recommendations and advice for buying a wooden train set, based on years of train play experience with many different brands. There are some safety notes at the bottom of that post that particularly apply to toddlers playing with wooden trains, and I recommend that you read those before purchasing them. We just got this big, bright, sturdy train a couple of weeks ago, and even at the age of five, the Little Engineer loves it! It’s perfect for toddlers, and so adorable. Green Toys makes all their plastic toys from recycled milk jugs, making this a safer choice than average for sure. It also comes in a pink/green color combination, pictured below. We have a one of these Viking Chubbies vehicles — a little blue truck — and we’ve played with the trains at a toy store. These are nice, sturdy plastic vehicles. A connectible train engine and car seem to come in this set, but in the reviews someone suggested that the vehicles in the bucket are a random assortment, so keep that in mind. Here’s another sturdy plastic train we’ve played with in a toy store. This DUPLO train very cost-effective way to get more wheel bases for building your own DUPLO trains. We have two sets, and the Little Engineer loves playing with the number blocks! 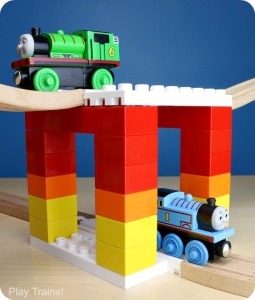 If you have both wooden train tracks and DUPLO blocks, you’ve probably thought it would be great to have a reliable way of combining them. Finally, there is one! We received some of the platforms from Dreamup Toys, and we absolutely love them. 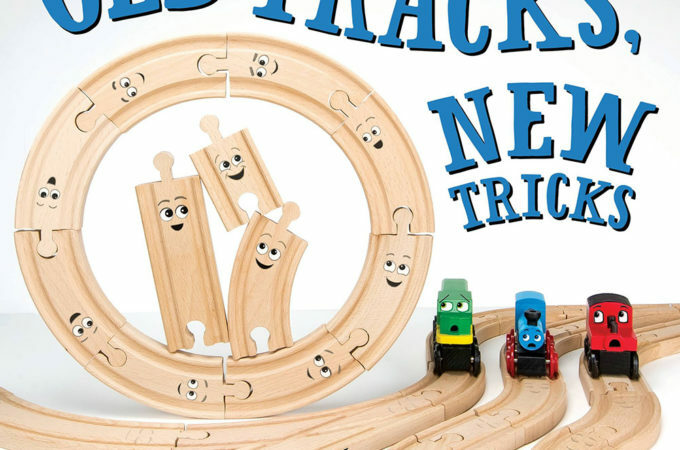 They’ve inspired a new wave of wooden train interest in my five-year-old, and I think they’d be equally exciting for a toddler. This set of DUPLO figures includes a train engineer and conductor. It’s a great way to add pretend play possibilities to your DUPLO blocks, and they make great passengers for DUPLO trains. The Little Engineer always loves pressing the buttons on these Sesame Street trains in the toy store! Adding the shape and function of a train to an already popular activity — playing with blocks — makes it even more fun for toddlers. The Little Engineer got the Melissa and Doug train below for Christmas when he was one, and he liked it so much that I eventually ended up buying a second set so he could have more variety when designing his block trains. Instead of blocks with holes that slide over pegs, this stacking train uses magnets to hold the train together. We’ve had this stacking train for years, and the Little Engineer still enjoys it at the age of five! I love the colors of this block train. This stacking train features an engineer and a short cord to pull the train along. Fun! Plan Toys also makes their toys out of recycled rubberwood and uses vegetable dyes and nontoxic finishes. If you’ve read any of my parenting articles, you’ll know that I like to find ways to use my son’s love for trains to make our days go more smoothly. Here are some ways to make these sometimes difficult daily events more fun. We have these, and they’re still in great condition after a few years of use. These are great, both as squirting bath toys and as waterproof trains to play with in the pool or at the beach without worry about ruining them. My son still enjoys playing with this bath toy, three years later. We have this amazing ride-on Thomas, thanks to my mom’s skill at combing Craigslist for deals. If you can find one used (and then find the instructions online to install a switch so the engine will keep going without the child having to hold down the stiff button), it’s really cool. 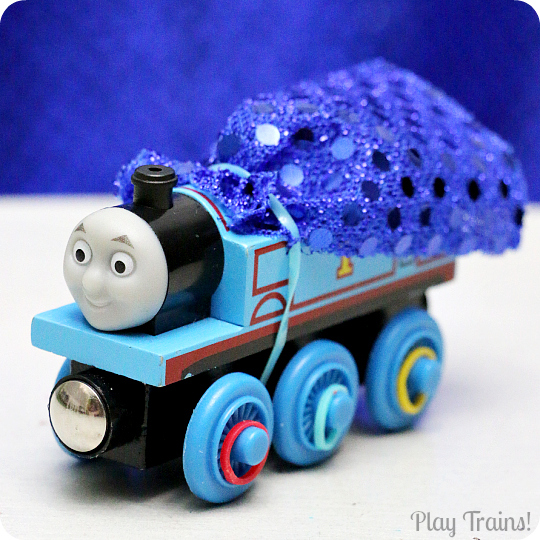 But here are some great toys that can let your child feel like Thomas’ driver with a lot less effort than that. One of the pairs of teddy bears is a pair of Engineer Bears! I could make a much, much longer list of good train books for toddlers, and someday I’m sure I will. For now, here are some of our favorites off the top of my head. Simple illustrations and text, but very engaging for toddlers and preschoolers who love trains. I love reading this one. My son loves listening to it. This is pretty much the only train poetry book out there, and it’s actually pretty well done and enjoyable to read aloud. This is an excellent first set of Thomas books for a toddler — very gentle and fun to read aloud! There are tons of flaps to lift in this one. Still a favorite at our house, years later. If you found this gift guide helpful, I recommend signing up for our email newsletter because I’ll be writing more like it for other ages and interests in the (hopefully) near future. 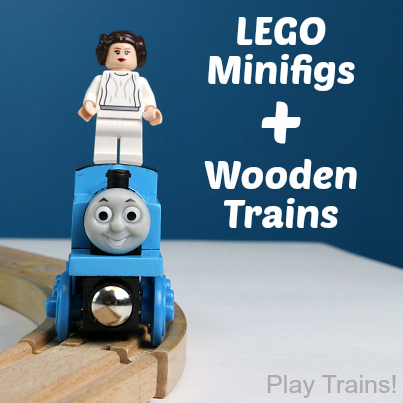 Plus, you’ll never miss any of our new ideas for playing and learning with trains. And please visit the main page for the Gift Guides for Kids to check out all the other great gift lists. 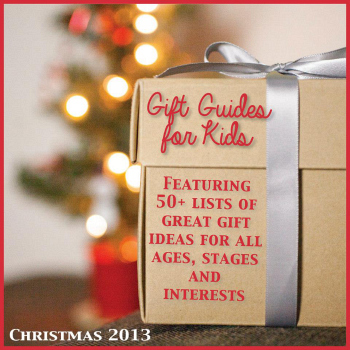 We also have a Gift Guides for Kids Pinterest board you’ll want to follow. This is an amazing resource for finding the right gift for any child, and I’m so excited to be a part of it! I never knew there were so many types of trains! Those stacking trains are awesome! You have no idea, Emma! 😀 I’m amazed that I can still find new train toys and books I’ve never seen before. I love that magnetic stacking train. I wish I could go back a year or two and get it for my son then. Though he’d probably happily play with it now, too. Thanks, Blayne! I love hearing about your little guy’s progress into the world of trains. 🙂 That’s a cool train Little People train…I actually have never seen that one! I’m hoping to do the ultimate guide to Ikea train sets at some point, probably after the holidays. One trick with low bridges is to use other pieces of tracks or thin blocks to prop up the bridge supports (on the inside edge, opposite where they connect to the ground level tracks). Before he loved trains, my son was really into planes. When he was 9 or 10 months old, we’d sit out on our deck and watch them fly over our backyard, and he’d sign “PLANE!” at each one. <3 And even better, he would be inside and hear one outside, and sign it then with a questioning look on his face. I miss that age so much! What a fantastic list! We bought the Duplo Number Train for my son’s birthday and really like it. And you are so right that it gives you more wheel bases for other building. I of course love the booklist too. We’ve really been enjoying the board book version of the Little Engine that Could and Little Engine Saves the Day. What a fantastic compilation -thank you! My little guy is a fan of anything with wheels, so trains are right up there. I just ordered that book, Chugga-Chugga Choo-Choo for him for CHristmas. I just love the illustrations! I found this through pinterest. I love that my little boy loves trains, and all other forms of transportation! I just wanted to share with you my son’s favorite book. It’s the Goodnight Train. We got it over the summer when we were visiting family in Iowa. They had the best toys in their gift shop! I got each of my children little conductor hats and handkerchiefs, train whistles, and of course rock candy suckers. If you’re looking for suggestions to add to the list, the book “Trains Go” by Steve Light is the board book that got my son interested in trains. So much fun to read with him, make up variations on the sounds and act out the noises the trains make.